For centuries, our ancestors have noticed signs of Destiny, indicating a near misfortune. The most faithful of omens have survived to this day, along with ways to combat them. Knowing how to reverse the bad omens, you can change your life for the better. According to the esoteric, the action of the bad will take most often felt by people with weakened energy. In order to attract luck and luck into your life, it is necessary to increase energy flows through the meditative practice of opening the chakras. Spilled salt. There is hardly a person who does not know the meaning of this omen. Sprinkle salt — seriously quarrel with people close and dear to you. However, there is a popular way to avoid a scandal: the salt must be carefully collected and completely dissolved in hot water. The resulting solution must be poured over the threshold of the house. Black cat running across the road. 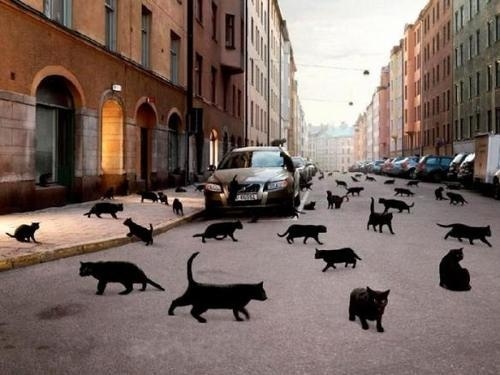 We all know what to do if we see a black cat running across our path. It is necessary either to drive the animal away without causing him harm, or to go another way. But what to do if the cat has already run in front of you, and there is no other way? Practitioners advise in this case boldly go forward, throwing a few small coins over the left shoulder. In this way, the channel of negative energy will be closed, and troubles will bypass you. Broken mirror — 7 years of misfortunes. This sign scares people the most. Bioenergy confirms that a broken personal mirror can really lead to health problems and bad luck. A mirror is a mystical object capable of “memorizing” the reflection of a person’s biofield. There is a high probability that the residual energy trace will be damaged along with the broken mirror surface. However, if this has already happened, it is necessary to “erase” your connection with the broken mirror: to do this, collect all the fragments and cover them with salt for a day. After this, the splinters and salt must be buried away from the house. Bird, flew into the house. It is believed that a bird unexpectedly flown into a house is a serious illness or death of a family member. Despite the ominous meaning of this prediction, it is easy to turn him away from himself and his loved ones: the bird must be carefully caught, fed and released from the hands. The gift received from you will close the energy channel and can significantly mitigate or even cancel the bad omen. Return to the place where you just left. An extremely unsuccessful decision is to return to the house or to any other room that you recently left. This bad sign of the esoteric explain the centuries-old belief: people return home, to relatives or friends, to say goodbye forever. Despite the darkness of omens, it is extremely easy to deal with: for this you need to use the energy properties of the mirror. Upon entering the room, you need to make a funny “face” and look in the mirror in the hallway. It is believed that this will confuse evil spirits and help to leave unidentified.